Steam: a much better way of propelling vehicles and harnessing energy. Electricity: a much better way of powering things and transmitting energy. Intelligence: taking data and turning it into insights that enable jobs to be done more efficiently- or do jobs that couldn’t have been done before due to the complexity or response time needed. To clarify, the trend is called “artificial intelligence” (AI). It is not new and the intelligence is not artificial. It is real intelligence programmed by people into software that runs on computers. The first group to dive into this was a group in the MIT labs in the mid to late 1970’s. From this, they created LISP Machines Inc. This brought the first artificial intelligence language/software to market. I had the opportunity to interact with them. What they were doing was fascinating. Today, we are building on top of that and a lot of work that has been done since. This technology is built into so many things we see today, for example: the recommendation engine in Amazon ("people who bought this also bought…"), Google Adwords, Facebook and Pandora and all software that learns what a user wants based on what they do… Google’s search engine, which is continuously learning/updating what to present to the user… Apple’s Siri… Facebook’s facial recognition… and the list goes on. 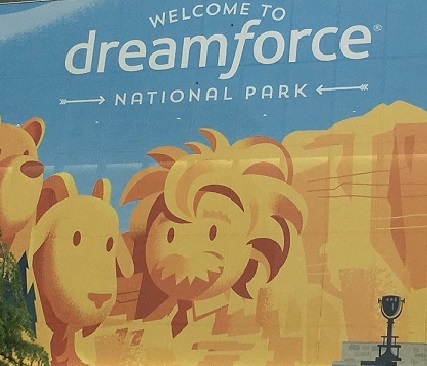 The AI theme was quite visible in Salesforce’s keynotes and presentations. Salesforce showed Einstein, the AI engine they bought, and how it could impact many functions across a company. In sales, for example, it can analyze your pipeline and return insight into what is going on, explain why, recommend how to improve it and predict the outcome if you take the recommendation. On the Cloud Expo floor, there were many apps touting AI capabilities; enabling natural language interfaces, AI-driven analytics and recommendation engines to name three. The applications included enabling users to input data via voice, training and development environments for sales teams and analytics engines that do analysis that could not be done before and provide new insights. This is a great example of how trends take a while to develop, then they emerge and “all of a sudden” are a big deal. This exponential development of AI tools has been enabled by the fact that today’s developer can assemble the building blocks that have been developed before and add their innovation on top of it. See how you can utilize Salesforce’s Einstein. It can help you do a better job of finding the best leads and opportunities to work on and help you identify deals that need to be worked on to make your forecast. Use some of the other tools in the AppExchange to improve your team’s effectiveness and efficiency. For example, there are offerings that enable you to record and serve up video for training and vetting of sales reps. One of these uses IBM’s Watson to review presentations that sales reps record and submit. The program grades how well a customer will receive a presentation from an emotional perspective and provides a translation of the script for the evaluator to read. The manager or assigned person then reviews the presentation- accessing it through the system- and provides feedback. You can also place the presentations on a leader board so that team members learn from each other. With all of this, if you are managing complex, B2B deals that require proactive sales efforts or are selling to important accounts that require strategic effort to win and continue to grow, having a strategic plan is important and requires human effort and oversight.